Despite the strength of the US currency in late summer and early autumn, the Canadian dollar is dominating the pair for three months. One should note a wide range of movement of the instrument, which indicates an ambiguous situation between two currencies. The “Canadian” received the main impulse for growth after the increase in the key rate in July, after which it only grew against all the main competitors. The policy of the Bank of Canada is aimed at further raising of the rates, which will help to keep inflation at the target level. The next meeting of the regulator is scheduled for the end of October. 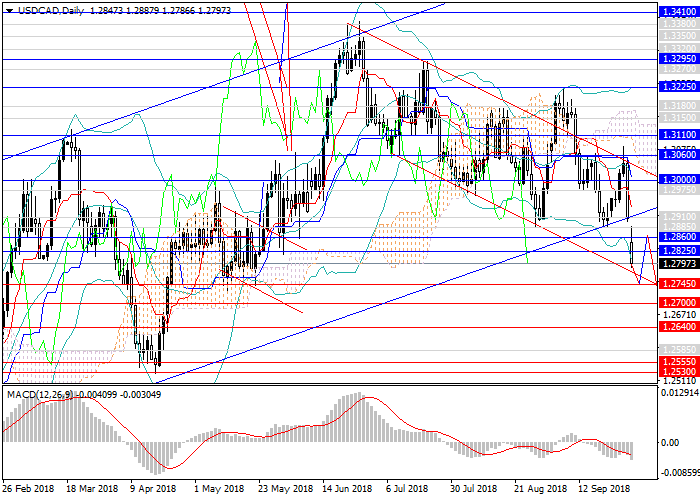 At the end of September, the pair moved upwards, but after reaching the key resistance level of 1.3060, which was the upper border of the descending range, sharply headed down due to the release of strong data on the economic growth of Canada in July. This impulse still controls the movement of the instrument: in less than two days, the pair has gone through almost 300 points. At the end of the week, major releases will be published, namely, data on the US and Canadian labor markets, including Nonfarm Payrolls in the United States. In the short term, the current momentum may extend to 1.2745, the first strong support level. In the future, a correctional movement up to the levels of 1.2825, 1.2860, 1.1285 is expected. In the medium term, the downward trend will continue, as confirmed by all technical indicators: MACD shows a sharp decrease in the volume of long positions, Bollinger Bands reversed down; on W1 chart, the pair broke the lower border of the long-term uptrend and the Kijun Sen, Tenkan Sen lines of the Ichimoku indicator from the top down. Support levels: 1.2780, 1.2745, 1.2700, 1.2640, 1.2585, 1.2555, 1.2530. Resistance levels: 1.2825, 1.2860, 1.2885, 1.2910, 1.2975, 1.3000, 1.3060. Deferred short positions may be opened from the levels of 1.2960, 1.2910, 1.2880 with the target at 1.2550 and stop loss at 1.3110.